The Toronto Chapter is holding a dinner meeting on “Accessibility in Buildings: Myths, Errors, and Omissions”. The event will take place at the Toronto Cricket, Skating, and Curling Club on Tuesday, February 5, starting at 5:15 p.m. Rob Chiles, Alta Equipment; Jim Blanchard, former Michigan governor; Mickey Redmond, former Detroit Red Wing; Rick Snyder, Michigan governor; Kelly Craft, United States ambassador to Canada; and Amarjeet Sohi, Canadian minister of natural resources, attend the groundbreaking of Gordie Howe International Bridge in Detroit, Michigan. After more than seven years of delays, construction has begun in Detroit, Michigan, on the Gordie Howe International Bridge. 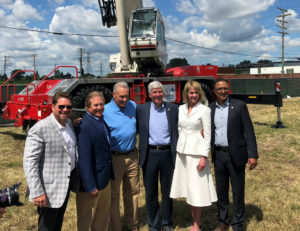 The $4.5-billion project will connect Windsor, Ont., to Detroit, creating a new option for travel between Canada and the United States across the Detroit River at a location 3.2 km (2 mi) downstream from the current Ambassador Bridge. In September, the Windsor-Detroit Bridge Authority, the agency with project oversight, is expected to award the construction contract and hold an official groundbreaking at the Windsor terminus. Major construction is expected to begin at this time. Early work on the Canadian port of entry began in 2015, with the construction of a perimeter access road, utility relocation, and the placement of fill, grading and drainage. During construction, it is expected more than 100 pieces of heavy equipment will be required to facilitate the work. Chiles and others from Alta Equipment, including company spokesperson and former Detroit Red Wing Mickey Redmond, were invited to attend the official groundbreaking ceremony, along with Amarjeet Sohi, federal minister of natural resources, Snyder, and Kelly Craft, the United States ambassador to Canada. Construction is expected to take four to five years to complete, with the opening of the bridge slated for 2022 or 2023.